Imagine – you wearing your favourite black dress or shirt and then you see flakes all over it. That’s not nice, is it?. To top it off you have this urge to scratch. Gosh, the whole dandruff experience is embarrassing and annoying. The worst thing is it’s not easy to get rid of those itchy, flaky bits. It’s because dandruff has so many causes. Dandruff can be an indicator that there is something not quite right with your body. Maybe you are not drinking enough water and therefore have dehydrated skin and scalp. An itchy, flaky skin can also be due to a lack of essential fats in your body. Fats have a bad reputation, but there are so-called good fats. Bad fats are fried foods, hydrogenated oils and refined oils – which you want to keep to a minimum. Good fats are the nuts and seeds and their cold-pressed oils. I have put down a list at the end of this article. Another cause of dandruff is harsh detergents in the shampoos or hair care products. These synthetic chemicals can produce an allergic reaction in some people, causing skin irritation, redness and flaky skin. Other causes may be hard water, certain medication, and stress. But till you figure out what is causing dandruff, follow these 3 simple steps to bring an instant relief from the nasty flakes. The first step is to loosen up the dandruff flakes and the dead skin cell which are clogging the scalp skin. This will get your scalp breathing and also start the healing process. How to do it? Simply apply oil to your scalp and massage with your finger to loosen the flakes. There are many beneficial oils for dandruff such as coconut, olive and avocado. I wouldn’t say one is better than the other, it’s a matter of personal choice and what works for you. 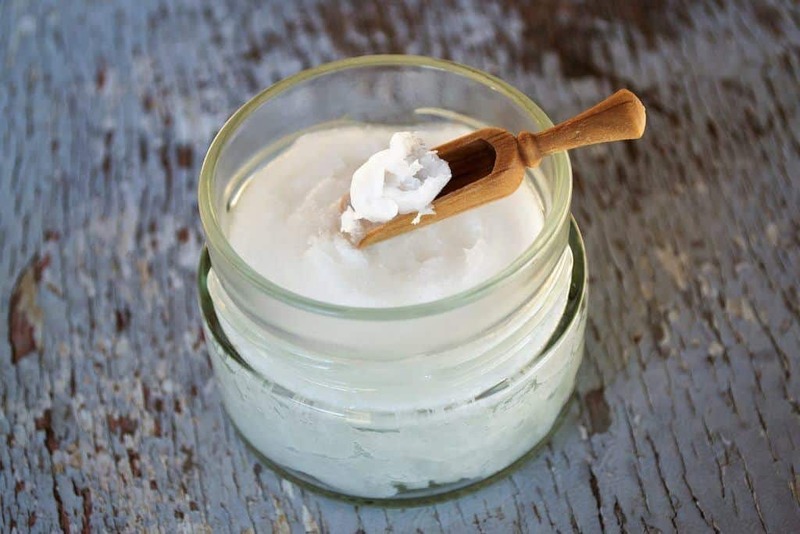 -use Coconut Oil if your dandruff is due to fungus and oily scalp. -use Olive Oil if your dandruff is due to scalp dryness. -use Avocado Oil if your scalp is flaky and itchy and needs soothing. Place the coconut oil in a bowl. You can add neem oil etc., and mix well. 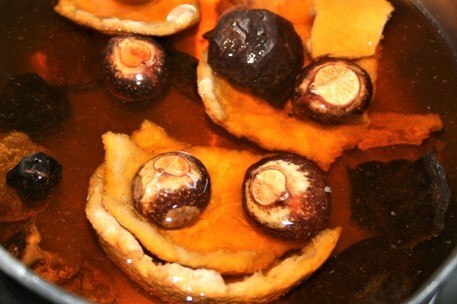 If the oils are solid, you can place them in a hot water container until they melt. But it’s not necessary. Start with dry or damp hair. Apply the oil to your scalp and hair. Now using your fingers, massage your scalp – this will exfoliate and dislodge even the stubborn flakes from your scalp. You can also use a wide-tooth wood comb to massage your scalp. Let it soak for an hour (or overnight for best results). Next wash with a natural shampoo. Or if your dandruff is really bad, follow step two. Yogurt is an excellent home-remedy for dandruff. Yogurt contains tons of healthy bacteria that help to fight dandruff causing yeast. Also, the lactic acid in the yogurt has gentle exfoliating action. It will remove the dead skin and flakes to promote clean and healthy scalp. At the same time, yogurt conditions, moisturises, and adds volume and shine to your hair. You can use yogurt on its own, or combine it with fenugreek powder. I like the combination of yogurt and fenugreek. It works magic to ward off those flakes. Fenugreek is a popular spice in Indian cooking. But it also has amazing beauty and healing benefits. Its properties soothe irritated, itchy skin, and help clear up dandruff. Plus, fenugreek is very moisturising and nourishing for hair. Regular use of fenugreek in a hair mask or hair oil will improve hair growth, and make your hair soft, shiny and fuller looking. 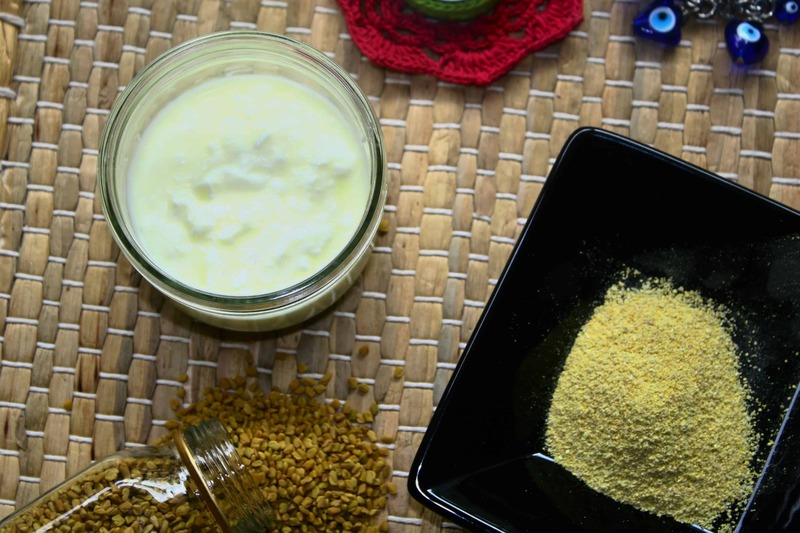 It’s very simple to prepare and use the yogurt and fenugreek mask – here’s how to make and use this ultra effective dandruff mask. Many a times dandruff is caused due to an allergic reaction to detergents in the shampoo or conditioner, especially the SLS (sodium lauryl sulphate). So buying SLS-free natural shampoo can help to a great extent. But even the so-called natural or organic shampoos do not work for everyone. Because they still have detergents in them and may cause dry, itchy, flaky scalp. So for those of you who cannot use any store bought shampoo, use a homemade shampoo. Here are 3 anti-dandruff homemade shampoo recipes that will get rid of dandruff and also make your hair soft and shiny. 1. Yogurt: Yogurt is good as a scalp mask. But eating yogurt will also help a great deal. Live or homemade yogurt contains tons of healthy bacteria – which helps to keep dandruff causing yeast/fungus in check. 2. Take a daily dose of Healthy fats: Healthy fats are anti-inflammatory and they will slow down the production of flakes and soothe irritated skin. Good fats are ghee, butter, avocados, nuts (cashew, almonds, peanut, walnut), and seeds (pumpkin, sesame, sunflower). 3. Veggies & Fruits: Fresh vegetables and fruits are full of antioxidants and phytonutrients. These nutrients renew and repair the cells of our bodies(including scalp cells). So make sure you get your daily supply. 4. Turmeric: Widely used in Indian cooking, this yellow root is getting a great popularity worldwide. Thanks to its strong anti-inflammatory, antioxidant and antiseptic properties. Turmeric helps to keep dandruff in check and also provides smooth and glowing skin. You can include turmeric in your soups, stir-fries, or drink it with milk. 5. Stay happy: Stress is the root of most illness, and it can even make your dandruff worse. Some of the proven ways that can help you stay happy are: exercise, write a gratitude journal, own less stuff, practice mindfulness (live in the present moment), help others, and lastly go out and do something that scares you (try new recipe, talk to a stranger, ask for a raise). 6. Last but not least take Vitamin C: This powerful antioxidant improves scalp circulation and helps to promote a healthy scalp. Foods rich in vitamin C are amla, lime, citrus fruits, berries, cabbage, cauliflower, papaya, pepper and potato. Oils: You can get coconut oil, olive oil and avocado oil in your grocery shop, or health foods store or online. For maximum goodness, make sure that the oils are unrefined and cold pressed. Shikakai powder: Again, you can find this in India store, or it’s easily available online. In Feb this year after going through hair loss from your recommendations of going through re-shee shampoo, I have got good news to share with you Mam. Now I have some queries for which I need your help.Firstly my front hair is thin so is there any solution to make it thicker? Secondly I get cold very easily even after having amla & citrus fruits so Mam is there any other way to use re-shee shampoo like after preparing the re-shee shampoo before rinsing my hair in winters can I just boil it & make it a little mild warm since the re-shee water is cold before rinsing my hair?Also can I have amla in winters ?? Also mam if I have to travel & not in town & in some other place then is there any other way of using re-shee shampoo ?? To make your hair thick, use egg and olive oil hair mask weekly. You can warm the shampoo in winters. And also eat amla in winters – that is the season of fresh amla (oct to march). When you are not in town use the powders (add fenugreek powder as well). Thank You so much Mam for this guidance. Just one query Mam in March this year after going through your respective page, I asked for your help regarding my hair loss that used to happen after oiling my hair as I used to wash it off i had lost lots of hair for which you have recommended me as I had been going through oil imbalance so I need to stop oiling my hair & just wash my hair with the Re-She shampoo thrice a week & since then I am following that guidance of yours Mam. But now Mam with your saying of egg & olive oil hair mask, I am scared as putting oil if again I go through hair loss then?? Use egg and honey mask, skip olive oil. Let me know how it works for you. Actually Mam I am a vegetarian so is any other option except egg.The problem I am having is my front line hair is less due to which I can see my bald head in between the hair from front. I have some queries also.Firstly my aunt is saying to use Bhringraj for hair regrowth.Does that really provide so,want your opinion to these Mam. Also I have gone through the Besan hair thick growth pack.So except egg please guide me Mam what I should do.Please help me Mam. I am new to trying ayurvedic cleansing on my hair. I am Black so my hair is prone to being dry. Also i suffer with oily scalp and sebhorric dermatitis, so i must cleanse my hair every 3-4 days. I find that using any oils on my scalp exhasperates the problem and is very hard to wash off. I recently tried cleanisng using Shikakai, alma, funegreek and marshmallow root powders. My hair feels great, but there is a bit of residue left on my scalp. Idk if it’s my natural sebum or from the powders itself. But I really want to stick to this as I am sure its better for my scalp than using commercial anti dandruff shampoo. Sorry for the lengthy post, but do you have any advice for me on how best to use these powders to really cleanse my scalo so the inflammation will calm down? How often can you do this. Thank you. I tried rice water and it has definitely helped with my dandruff. Will try it with shikakai next time. thanks for sharing.